Apr 16 2011: After the end of the Bike Boy party the Natooke employees started goofing around in front of Peter's camera. These are some of the shots which reflect the amount of fun we had after a long day of preparation, coordination, cycling and party. Apr 16 2011: After the fixed gear allycat race Lining arranged a party with MC Hotdog and DJ Sam Lee as well as 24 Herbs group. STC set up the JisuPK and the fixie teams did some tricks on the tiny stage. In the background were fixed gear bikes all from NATOOKE. Apr 16 2011: Natooke held the prize ceremony for the Beijing Bike Boy Alleycat race. The categories were women and men living in Beijing and men not living in Beijing. The prizes for the winners were all sponsored by Lining. Apr 16 2011: Lining Bike Boy Alleycat fixed gear race through Beijing ended at the Iberia Center for Contemporary Art. The racers came back sweaty, dusty and tired but happy. Apr 16 2011: All racers of the Beijing Bike Boy Alleycat had to come to the Natooke shop checkpoint. There was a ping pong game. Apr 16 2011: The cyclists of the April 2011 Beijing Bike Boy Alleycat fixed gear bike race had to do fun bike related games at the various checkpoints scattered around the Beijing city. Apr 16 2011: The start of the Beijing Bike Boy Alleycat fixie bicycle race in pictures: We started running from inside the Iberia Center for Contemporary Art out to our bikes that were laid in front of the entrance. Apr 16 2011: Natooke and friends were the ones organizing the Lining Bike Boy Alleycat fixed gear bike race. Here are some pictures of the preparations on the day of the race and some of our volunteers and cycling friends. Mar 07 2011: Beijing Fixed Gear and Juggling Shop is now 2 year's old! We had a small party with some friends in our small little crammed shop. It was fun to have this 2 year shop anniversary celebration. Dec 18 2010: Out on a Sunday afternoon fixed gear ride despite the cold Beijing weather. Some tough Beijing FG riders head north for a park, only the 2 girls get in without getting caught by the park police. Even bike girls can be sweet and have a charming smile. Dec 10 2010: Fixed gear riders from Hangzhou, Guangzhou, Shenzhen, Hong Kong and Taiwan were invited to the Bike Boy event. But the only female rider from Ines Brunn from Beijing showed them all what kind of crazy tricks can be done on a track bike. 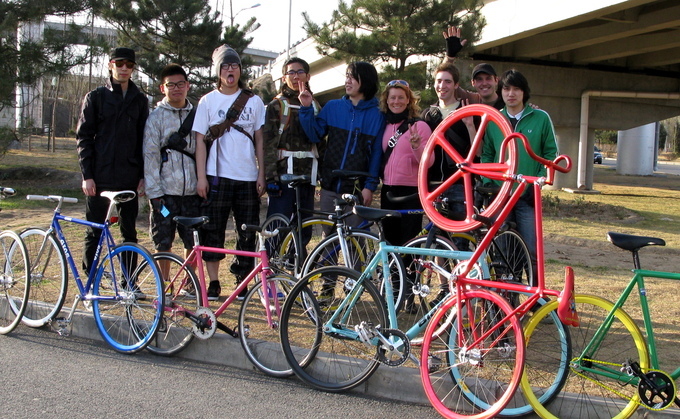 Dec 10 2010: The Chinese sports brand LiNing and the youth and fashion magazine YOHO asked Natooke to decorate the Bike Boy event with fixed gear bikes, fixie parts and accessories to give the event location in Beijing a street feeling. Dec 9 2010: Ines Brunn playing around on her new Flying Banana fixed gear bike while waiting for the film crew. Carolina took some shots of her bicycle stunts. Sept 12 2010: A variety of performers entertain the crowd at the Beijing Sanlitun the Village Mall. Trick bike performance by Ines Brunn. Aug 22 2010: Another Summer Sunday Entertainment in the Beijing Sanlitun Village Shopping Mall organized by Natooke. Various performers including Ines Brunn doing incredible tricks on her fixed gear bike in a lovely outfit. Aug 2 2010: Zhejiang TV Station big show to find the best hero. Ines performed her amazing trick bike show on her fixed gear bicycle and won. July 9 2010: 3G Mobile Phone Application Party. They invited Ines Brunn to perform at the beginning of the event with her trick bike show on the tiny stage of 3 x 5 meters. June 19 2010: Bicycle Film Festival 2010 10th Year Anniversary in New Yong City. Ines Brunn performing at the street party with amazing fixed gear bike tricks. 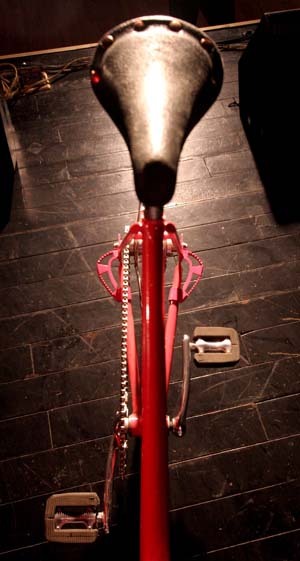 May 9 2010: STC Beijing organized fun Goldsprints competition on fixed gear bicycles at the Ditan Park Folk music festival. This bike race is called Jisu PK and is fun for anybody to join in. It was great to see mainly Chinese participate. May 6 2010: Quite a big crowd came out today to ride fixed gear. We rode a loop down Yonghegong Dajie, then West on Changan Boulevard and then around the 2nd Ring Road. It is amazing to see the amount of new Beijing fixed gear cyclists. Apr 30 2010: China Cycle Exhbition 2010 in Shanghai. Ines Brunn doing tricks on the green bamboo bicycle made by Stalk Bicycles. She drew a big crowd every time she performed during the bike exhibition. Apr 27 2010: China Cycle Exhbition 2010 in Shanghai. Ines Brunn brought her environmentally friendly bamboo bicycle made by Zack Jiang and performed her jaw-dropping tricks at the exhibition. Mar 31 2010: Beijing Fixed Gear bike group met up in the tunnel for some shooting for a clip for the Shanghai World Expo 2010. The background is "Love and Share" and how cycling has low carbon emissions. That means I might have to actually go to Shanghai to see it! Mar 28 2010: Beijing Smarter Than Car (STC) Group held a spring ride for all kinds of bicycles. The majority of cyclists came on their fixed gear bikes and enjoyed the ride in the sunshine. Shannon Bufton and Ines Brunn are hoping for more cyclists on the next STC rides. Jan 14 2010: The Beijing bicycle and juggling accessory store is evolving very fast. Here are some pictures of how the shop looks like 1 month before Chinese New Year. Jan 14 2010: The UCI World Cup in Track Cycling is to be held soon in Beijing. These are photos of the Chinese National Team during their standard competition preparation training. December 20: Small group of Beijing Fixed Gear bike riding in cold but sunny weather to the Beijing 798 art district to listen to a talk about contemporary art by fellow fixies held at UCCA museum. December 6: Beijing Fixed Gear Ride on Track Bikes from Natooke Shop all the way West along the Changan Boulevard until we reached a Steel Factory outside 5th Ring Road in the West of Beijing. November 23: Bicycle Film Festival 2009 in Tokyo: Ines Brunn performing stunts on her trick bike at the BFF Block Party at the Olympic Park - One time a not so fancy performance and the second time the full circus style trick riding show. November 23: Bicycle Film Festival 2009 in Tokyo: BFF Block Party at the Olympic Park with fun bike contests - bunny hop with BMX and fixed gear, BMX race, wheel rolling and lots of fun around bikes. November 23: Bicycle Film Festival 2009 in Tokyo: Us 3 girls on bikes cycled all the way to the Olympic Park where the BFF Block Party was held. After the whole event we went to Kinfolk bar for the afterparty. November 22: Bicycle Film Festival 2009 in Tokyo: There are so many fixed gear and single speed bicycles in this city - everywhere. A lot of them are really beautiful, most of them have front brakes. November 22: Bicycle Film Festival 2009 in Tokyo: Second day and again four different movie screenings with various long and short bicycle movies. In the evening I met the film makers of "riding in the circle" for dinner we almost had as much fun as in February in Beijing. November 21: Bicycle Film Festival 2009 in Tokyo: Four different movie screenings with various long and short movies all around the topic of bikes. In the evening there was an afterparty called "Bikes Rock!" November 21: Bicycle Film Festival 2009 in Tokyo: I went again cycling around Tokyo on the fixed gear bike they gave me. Got a bit lost but did arrive for the movie screenings. November 20: Bicycle Film Festival 2009 in Tokyo: Great opening party in Combine bar. A huge barrel of sake was sponsored as well as sake cups with the BFF logo. And I did a trick bike performance. November 20: Bicycle Film Festival 2009 in Tokyo: Nora on a red Mamachari and me on a fixed gear bike cycled from where we were staying near the Rainbow Bridge to Shibuya. November 19: The Tokyo Bicycle Film Festival (BFF) started with a dinner for all the sponsors, helpers, volunteers and friends from around the world. Many Tokyo bicycle messengers are involved in this festival. November 18: The Japanese cyclist and monk Ko Masuda had a vernissage of his CYCLE ART in Aoyama in Tokyo. He does beautiful steel carving on bicycle parts as well as very energetic paintings on canvas and bicycles. October 6: A small group of about 10 riders set out for a fixed gear bicycle ride from Dongdan in downtown Beijing along Changan Boulevard passing the Tiananmen Square out West and then North to the Peking University campus. It was getting quite chilly that night but we still went for a roadside lamb skewer and beer dinner. October 4: On this blue sky fall day a small group of fixed gear cyclists decided to ride from the Natooke shop all the way along Beijing city canals eastwards until the merge with the Wenyu River and then do a loop along the River and back. It was a 3 hour and 68km long ride and the paths were almost always paved. September 4: At the huge European bicycle exhibition in Friedrichshafen I took some pictures of the beautiful single speed and fixed gear track bicycles displayed. August 14: The Beijing based photographer Simon Lim went out to capture me doing tricks on my fixed gear track bike. I was cycling around the Natooke shop doing some tricks and playing around. August 8: The day of the Opening Ceremony of the Beijing Olympics is now declared as the National Fitness Day of China. One year after the Games I performed my trick cycling on the ground of the National Olympics Sports Center to inspire people to do sports and exercise, stay fit and live a healthy life. May 31: 3 crazy foreigners thought it would be cool to ride up Xiang Shan Mountains on fixed gear. It turned out to be too steep to ride up and suprisingly also too steep to ride down. But the bikes did enjoy the view. May 26: Beijing Fixed Gear Group met up as always in the tunnel. But there were quite a lot of cyclists and electric bikes and tricycles coming through the tunnel. It was difficult to do tricks. Somebody actually crashed into our Xiao Shu who fell on the ground. But except for some scratches and dust nothing happened. April 26: Me doing a performance on my trick bike for a "Green" environmental event organized by the Beijing Radio Station and sponsored by Green Tea company. Afterwards all the participating Chinese cyclists set out for a bike ride around Beijing to promote cycling as an environmental friendly method of transportation. April 8: San Francisco Fixed Gear Filming for "Human Traffic". The Photographer Edsel Dilag came along and took some amazing shots. I asked for his permission to upload some of his pictures of me here on my website. Thanks Edsel! April 8: Second day of playing around on fixed gear in San Francisco and filming with the Macaframa guys for a completely new amazing movie. Thanks Justion for chosing nice places for filming! April 7: First day of fixed gear tricks in San Francisco with Clancy Feahr and Justin Gallagher. Justin is filming for a new crazy fixed gear movie. Clancy had put together a cute 26inch track bike for me with a rad scull stem! Thanks Clancy! October 31: Special Halloween Event organized by the International Performing Arts groups of Beijing. It was an audience interactive theater play called "Death Prom" and I did a kind of zombie style trick bike performance. Jun 22: 5 fixed gear riders and 4 fixed gear bikes: First Beijing "fixed only" ride to the Olympic Village. Visited Jason's t-shirt shop CHEESE in Jianwai SOHO and then rode a bit with him and his friend. April 26: Participated in bike games for the green bike event. I also performed with my trick bike. April 13: We went riding to the North of Beijing on a sunny day but encountered road construction in the Art District 798 and dirt roads along the 5th ring road. March: Hanging out at the Velo Culture bike shop in La Jolla and playing around. This was the first time for me to participate in a Critical Mass ride. More people than ever showed up - around 450 cyclists. Feb: We did not ride far as I only had my trick bike with a 1 to 1 gear ratio. 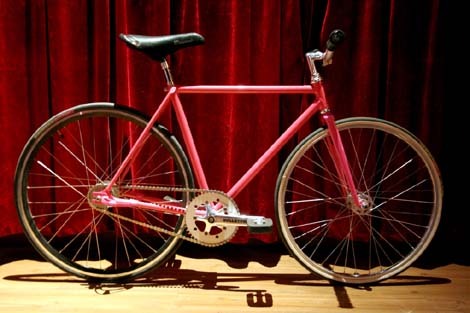 May: New York City art exhibition around fixed gear bikes. May: Bicycle street party with track stand and backward circle competitions. Dave (the famous - from Dave's Quality Meat street wear brand DQM) showed us some tricks on my trick bike. May: Arranged by the Bicycle Film Festival crew was a street parade going down 5 Avenue escorted by police. May: Ines performing at the opening party of the bike film festival in NYC. Click on the small pictures on the left or the underlined part to get to the respective photo album.